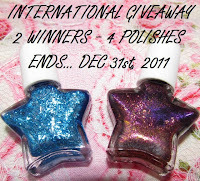 Princessly Polished: INTERNATIONAL GIVEAWAY: 2 Winners, 2 Glitrix Polishes each! Ends Dec 31st! 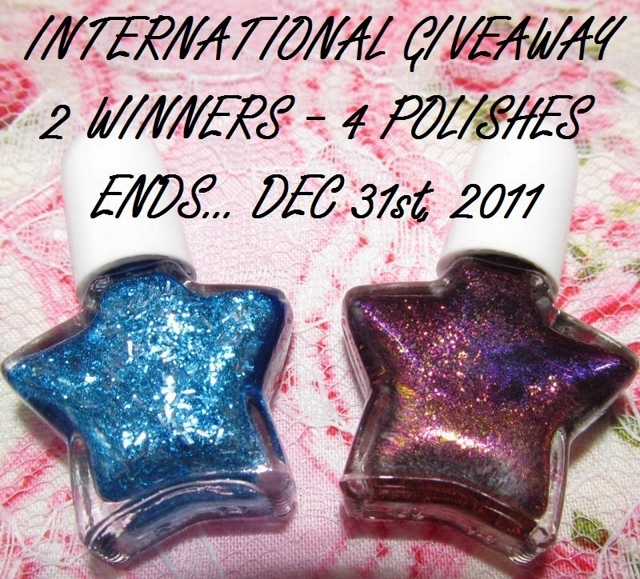 INTERNATIONAL GIVEAWAY: 2 Winners, 2 Glitrix Polishes each! Ends Dec 31st! Use code " 2011GLIX12 " for 10% off! You may use the above image to advertise the giveaway and thus earn yourself extra giveaway entries. If you make a blog post you may also you an extra photo from my swatches of these colors; your choice of photo! If you're adding an image to your sidebar here is a smaller version to use. I'm using Rafflecopter to run this giveaway and choose winners. All entries will be validated and illegitimate entries will be disqualified. I'm hoping to announce both winners in the first week of January. If you need any help entering or have questions about the giveaway just post them here! My favorite polish would be Royal Chic. I would love to see something orange. My favorite is Royal Chic! So pretty! I would like to see a bright pink with black glitter in it. Ooo, I just have to say I like your idea.. I love royal flush! I'd love to see some glitter in jelly bases! I'm most interested in glitter frankens! I would love to see holo frankens!!! I wanna see more holos plz! I'm most interested in seeing holographic polishes at Glitrix! I would like to see some douchechromes. Franken polish Royal chic is my fav. I really like the Franken Polish - Oceanic! My favorite is Royal Flush OMG! I would love to see some holo or mega flakes! I'm interested in seeing more glitter polishes with different shaped/size glitters in. I'd like to see a deep burgundy color and black (without glitter)! My favourite Franken polish is Royal Flush! 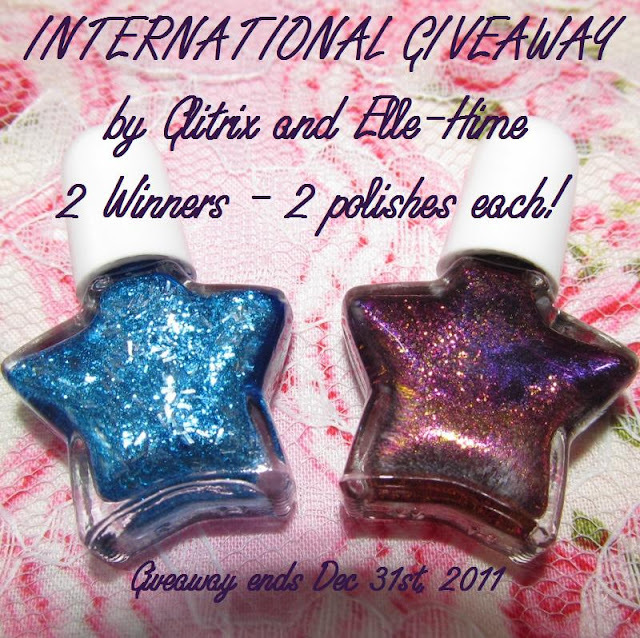 I would love to see a black glittery Franken polish from them! I'd love to see more confetti-type frankens from the shop, I think they're really pretty! Thank you for hosting this giveaway! the star bottles are so cute!! -I'd like to see more bar glitter, and black glitter would be fantastic! My favorite Franken Polish is Babylicious. I'd love to see more glitter polishes from Glitrix!